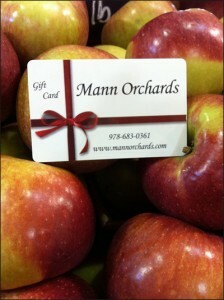 Mann Orchards is the oldest business in Methuen, Massachusetts and we are proud of our family roots. Since 1877, we have been proudly providing the people of the Merrimack Valley with the freshest produce and baked goods around. It is our goal to continue this tradition in everything we do. Charles Mann starts the Mann family farm in Methuen, MA in the early fall of 1877. Charles Mann’s son, Charles Mann Jr., takes over the family farm from his now retired father. What a beauty! Mann Orchard’s very first station wagon was purchased in the 1930’s. Ruth Mann, the daughter of Charles Jr., and her husband Don Fitzgerald, start to work with her father on the family farm. Around this time, Ruth begins baking her now famous pies in order to put away money to purchase a bed for her middle child Bill. Three generations of the family – Charles Jr., his son-in-law Don Fitzgerald and his grandson Bill – begin to work side by side on the family farm. They continue to do so, expanding the farm and growing the family business, for the next 20 years. In the August of 1973, the family team of Charles Jr., Don and Bill, move the family farm into Mann’s previous location at 65 Pleasant Valley Street in Methuen. The family bases its business here for the next 30 years. Bill marries the apple of his eye Kathy. Together they join Bill’s parents, Don and Ruth, in running the family orchard and farm stand, and are able to raise their own family, including Josh, Matt, and Allison, the same way Bill had been raised by his father – working side by side on the family farm. The Mann’s bakery expands to help meet the demand for fresh, home-made baked goods. Ruth’s best-selling pies are now joined by a variety of Mann and Fitzgerald family recipes, including cookies, fruit breads, rolls, scones and muffins. As the family farm continues to flourish, the fields start to grow a wider variety of products, such as tomatoes and hardy mums in the fall. After 30+ years at 65 Pleasant Valley Street in Methuen, Mann Orchards moves into a new, bigger home right down that street at 27 Pleasant Valley Street. This is a very big step for the business as well as the Fitzgerald Family. Mann Orchards launches its solar farm. The sun has always helped Manns grow the crops here on the farm – and with the sustainable energy gained from our solar project it now helps us produce our homemade pies! Bill and Kathy, joined with their sons, Josh and Matt and their daughter, Allison, are very excited to continue the family’s farming tradition and the opportunity to provide the people of the Merrimack Valley with the finest fruits, vegetables, baked goods and country lunches around.